…And more like those. But if milk is SO great, then why is it that so many people who grew up drinking a tall, cold glass of milk with meals (or anytime of the day) and continued drinking it on into adulthood, are now suffering from things such as Osteoporosis and other such diseases? Definitely something to think about, huh? Well, here’s the thing…CALCIUM is what’s important here and while milk does pose to be one of the best sources of calcium, there are just other things that come along with milk that makes one wonder if it’s worth it to risk it when there are so many other, viable sources of calcium available to us as humans. I mean, think about it; we get milk from who (or rather, what)? Cows, right? Yet, cows don’t drink the milk of another animal in order to get calcium for themselves nor to produce the calcium in their milk – which happens to be for THEIR babies. Cows (traditionally…in the right environment and habitat; not factory-farmed) get all the calcium they need from GREEN GRASS! In order to absorb calcium, the body needs comparable amounts of another mineral element, magnesium. Milk and dairy products contain only small amounts of magnesium. Magnesium is the center atom of chlorophyll: And chlorophyll comes from GREEN VEGETATION, not milk! So eat your leafy greens and get calcium your body can USE! But I’ll digress on that for now. My point is, we don’t necessarily “need” milk in order to get the calcium that we need. There are other sources that I’ll write about later. And besides, milk isn’t the ‘almighty’, wonderful source of calcium that the majority of people believe it is since pasteurization destroys all of the nutrients, including calcium. Reason #1 -Hormones – we all know and have seen the PETA movies showing what goes on in the factory farms – diseased cows “living” under less than acceptable living conditions and being injected with hormones and antibiotics. Not only that, but our body’s insulin-like growth factor-1 (IGF-1), a well-known promoter of cancer, is increased with the consumption of milk. Reason #5 -Lactose intolerance – If you experience severe gas, bloating, cramping and other digestive issues especially when you’ve consumed milk or other dairy products, it behooves you to look to dairy as one of the main factors causing it. Over 75% of the American population is lactose intolerant but many just don’t know/realize it. – There is no other milk-drinking species that drinks milk AFTER being weaned from it’s mother’s milk! 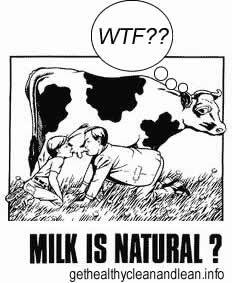 – There is no other milk-drinking species that (under normal conditions) drinks milk from ANOTHER species! I challenge you today to commit to at least one full week of consuming absolutely NO milk or other dairy products and see how you feel! I’d be interested in hearing about your experiences and what you noticed after 7 days of no dairy, so please come back and leave a comment about it. For non-dairy sources of calcium, click here. An addendum to this post – 8/16/12: Because I am CONSTANTLY a student of health and wellness, I’ve been doing more research and learning a bit more in relation to dairy. I’m still on the fence about it…but what I’ve been reading is making more and more sense to me – I will have to test it out to see if there truly IS a difference. What I’ve been learning basically states that if you MUST consume dairy, make sure that it is organic, raw and unpasteurized – which can typically be found in natural food stores and co-ops. If you cannot gain access to raw then at the very least get organic, hormone-free dairy products produced from the milk of non-factory farmed cows. If you cannot get either of those, then it is definitely best to just avoid dairy altogether.